A vegetarian for five years, Sasha, who lives in Northop Hall but hails from St Petersburg, Russia, began following a vegan diet after making a new year’s resolution to overhaul his diet. By looking for hints and tip on the social media platform Instagram, Sasha started making his own recipes. His dishes went down so well with friends and family, including son Leo, four, that Sasha has just launched his Vegan House mobile catering business and will be attending Mold Food & Drink Festival this year. Sasha said: “For me, this has been a gradual change and I didn’t become vegan overnight – for a while I was a flexi-tarian, following a vegetarian diet with perhaps meat very occasionally. 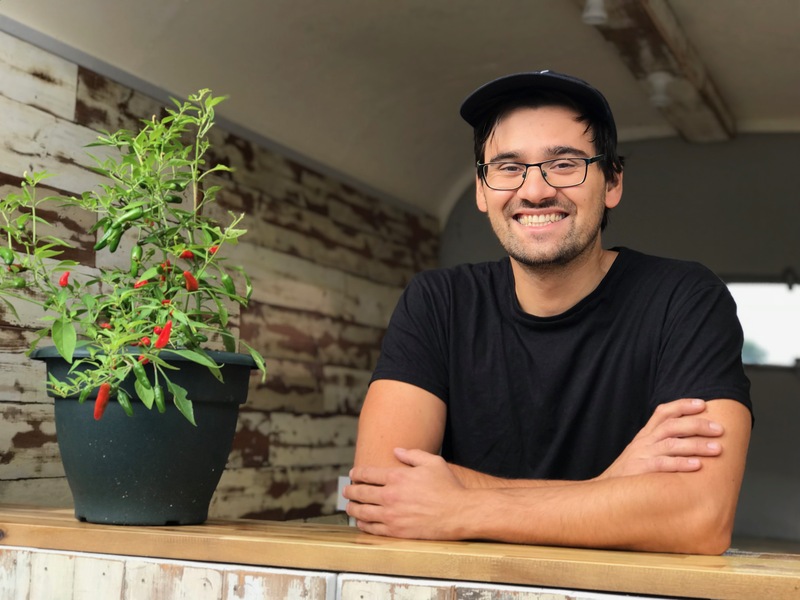 Inspired to showcase the benefits of a vegan diet, Sasha has converted a former horse box and transformed it into a mobile unit and will bring his new business to September’s Mold Food & Drink Festival. “Some people wrongly assume that everything we need comes from a range of meat, carbohydrates, and vegetables. That’s not the case. A bunch of dark green, leafy vegetables alongside some chick peas provides as much, if not more, protein, than steak and doesn’t contain the same amount of fat. “Everything we need can come from a plant-based diet but just small changes, such as introducing lentils to a dish, can make a big difference. There is a real thirst amongst young people in particular to follow diets with proven health benefits and festivals are a great way of reaching new people and showing what a difference changes to our diets can make,” added Sasha. Mold Food & Drink Festival chairman John Les Tomos said it would be the first time a vegan exhibitor had come to the festival. “Sasha and Vegan House will bring not just tasty food but plenty of food for thought too. There are not just health benefits to a vegan diet but global benefits too. Cutting down on food miles and packaging waste has benefits for the planet and these are all important messages Sasha will be sharing at the festival, where people can meet him to find out more,” added John. Vegan House will be at Mold Food & Drink Festival on September 15 and 16. Issued by Gunsmoke Communications for Mold Food and Drink Festival.